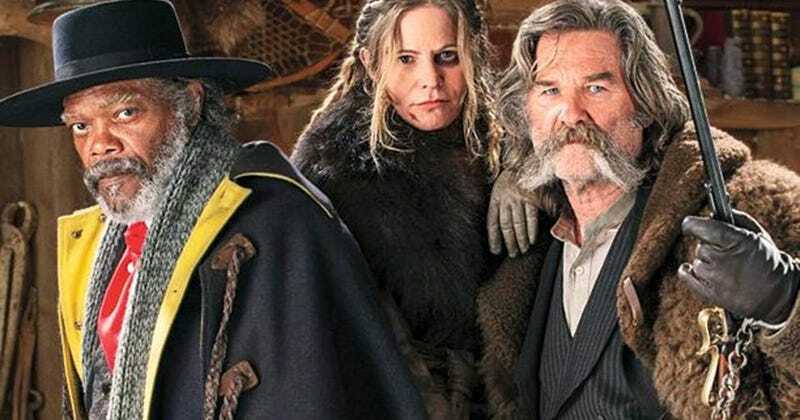 Quentin Tarantino came to Comic-Con to discuss his upcoming movie, The Hateful Eight, and despite seven minutes of new footage and actors like Kurt Russell, Tim Roth, Bruce Dern and Jennifer Jason Leigh being along for the ride, the presentation was all about technology and history. The panel began with a video, introduced by Samuel L. Jackson, explaining that The Hateful Eight will be getting a roadshow release on Christmas day. Basically, 100 theaters will screen the movie on 70mm film. It even teased it would have an overture, intermission and program. Tarantino shot the film in 65mm Ultra Panavision, which has an aspect ratio of 2:76 to 1. Most movies these days are 2:35 to 1, so Ultra is the largest widescreen format you can shoot on (It’s shot in 65 and projected at 70). To do this, Tarantino and his team went to Panavision and found their Ultra Panavision lenses. However, only one set had ever been made. That means the lenses that shot The Hateful Eight are the same lenses that shot Ben Hur, The Battle of the Bulge, Mutiny on the Bounty and It’s a Mad, Mad, Mad, Mad World. As for that footage, it was absolutely beautiful. Not just the detail—the snowflakes, the steam coming off a cup of coffee—but the oddball, fun characters Tarantino has created for the film. It’s probably the best footage shown in Hall H so far during Comic-Con.